You know how ACORN registered thousands of bogus voters like Mickey Mouse and Daffy Duck? ACORN's handlers at the Obama campaign seem to be accepting contributions from Mickey and Daffy too. It turns out that the Obama campaign's crack team of fundraisers decided to turn off all security validation for credit-card donations. Want to enter the name Pedro Martinez when the credit-card belongs to Arnold Fizbin? Need to use the ZIP code 99999 when the card owner's ZIP is 02154? No problem! The Obama campaign doesn't care! In order for this to occur, the "Address Verification System has to be specifically disabled to allow this fraud." 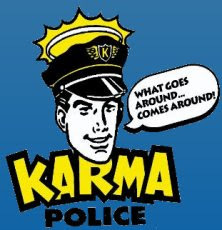 An earlier analysis of donations revealed millions of dollars in illegal donations from made up characters like "Doodad Pro" and "Good Will". These contributions were conveniently structured to fit in the "under $200" category, which the Obama campaign (unlike McCain) has refused to reveal. A... review of the Obama campaign finance filings found that the FEC had asked for the redesignation or refund of 53,828 donations, totaling just under $30 million. But none involves the donors who never appear in the Obama campaign reports, which the [Center for Responsive Politics] estimates at nearly half the $426.8 million the Obama campaign has raised to date. Let's see. 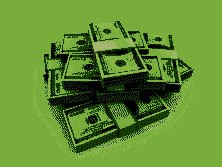 Half of $426 million is... carry the one... about $200 million! And this isn't headline news? But the new revelations of illegal donations appear to be a mixture of stolen (and unvalidated) credit-cards and willful violations of finance law. I'm not a math major, but Mary T. Biskup's contribution of $174,800 would appear to be over the $2,300 limit. Scott Johnson reports that tests of the Obama website confirm that all security validation is disabled. I went back to the Obama site and made three additional donations using the names Osama Bin Laden, Saddam Hussein and Bill Ayers, all with different addresses. All the transactions went through using the same credit card. I saved screenshots of the transactions... I tried the exact same thing at the McCain site and it didn't allow the transaction." 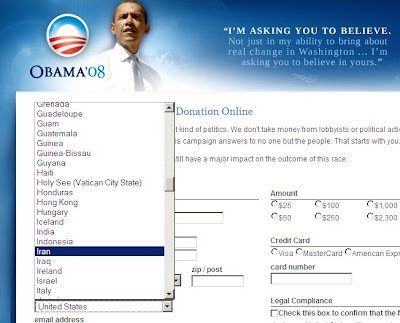 In May of this year I noted the fact that the Obama campaign ran the only website that permitted donations from foreign countries without any proof of citizenship. In contrast, the Hillary and McCain sites both required documentation before accepting a donation from a foreign country. While the Times' CSI unit probes Joe the Plumber's health records and scrutinizes Sarah Palin's shoe bills, an election is well nigh being stolen right under their very eyes. Although this scandal is a doozy, the Times is silent about this flagrant abuse of election law. Eleven days remain until the election... hundreds of millions of dollars in illegal and foreign donations appear to have flowed into Obama's coffers... and Manhattan's Pravda can't rustle up a story. Not to worry. I give them six months. Don't let these criminals steal the election. Vote.